-New option “File selection mode” whether multiple files will be read in automatically or manually out of a selected file list. 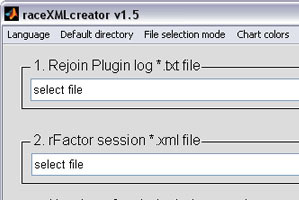 -New function “Check files order” of the selected file list. -New function to send the report to a FTP server. -New function to adjust chart colors. -Team page: show chart for laptimes. -Fixed bug at fastest lap page caused by no laptime and mulitple drivers.